Law firms are ultimately a product of their staff. At Moon Beever our highly skilled lawyers and our dedicated support teams have made the firm what it is today. Diversity and inclusion have always informed the way that we recruit, develop and retain talented people. We think that benefits not only our staff themselves but also our clients and the wider community. We have long worked with a number of organisations and networks to this end and our published diversity statistics show that we have made good progress. 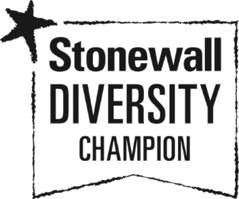 To further develop our position on diversity inside and outside the workplace, Moon Beever has recently joined Stonewall’s Diversity Champions programme. The programme has some 750 members, many from the legal and professional services sectors, but all with shared values in relation to inclusion and acceptance. Stonewall works with members to ensure that LGBT staff are “accepted without exception” in the workplace. The programme also aims to help us work proactively to improve wider attitudes to inclusivity and diversity. We are very pleased to be a member of the programme and look forward to working with Stonewall going forward.